A new cargo carrier has been registered in Belarus: Rada Airlines operates charter flights using a converted Ilyushin Il-62M. Rada Airlines received its Air Operator Certificate (AOC) one month ago, followinh five months of preparation. The first flight was performed on October 7, from Ukraine’s Odessa to a Thai airport. “We carried dolphins for a dolphinarium, and the Il-62 with its 40-ton payload capacity best fitted the purpose, because it covers the distance with just one technical stop. There are not so many aircraft types capable of performing such a flight, with reasonable economy,” CCO Dmitry Ishchenko told Russian Aviation Insider. 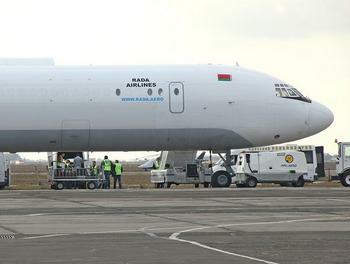 The aircraft Rada Airlines operates (tail number EW-450TR) has a large (3.45 by 2 m) cargo door. “It is one of only three such aircraft,” Ishchenko explains. “They were converted from passenger ailriners at Kazan Aviation Plant in 2007, and the modification was certified by Ilyushin [the OEM]. The aircraft were operated by the Kazan plant’s airline KAPO Avia on Russian domestic routes for over 10 years. However, the carrier’s AOC was suspended last year, and we decided to rent [one of] the aircraft and have an airline registered in Belarus.” The plant will still be responsible for the aircraft’s maintenance. Although the Il-62’s fuel burn is higher than that of comparably sized Western-built aircraft (A300-B4Fs, A300-600Fs, and DC-8s), it is competitive under the current conditions of low fuel prices and high dollar-to-rouble exchange rate, especially on routes exceeding 3,000 km, Ishchenko notes. The airliner’s maximum range with full payload is 6,200 km. The Il-62 stays within the current noise restriction limits, and is approved for flights to Europe. The airline is now studying the possibility of operating flights between Latin America, Europe, Africa, and the Middle East. Rada Airlines has no base airport as such. It has agreements with the airports in Orsha and Gomel (both situated in Belarus), but it would not be expedient to keep the aircraft parked there, Ishchenko notes: “As a charter airline we are planning to fly around the world without being tied to Belarus.” There are no immediate plans to operate flights to Russia. Long-term plans include fleet expansion: the carrier’s second Il-62 may enter service by the end of next year.